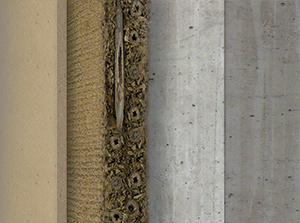 COMPOSITE UHPC-AAC/CLC FAÇADE ELEMENTS WITH MODIFIED INTERIOR PLASTER FOR NEW BUILDINGS AND REFURBISHMENT. Lorenzo Miccoli, Patrick Fontana, Nelson Silva, Andrea Klinge, Christer Cederqvist, Oliver Kreft, Dirk Qvaeschning, Christer Sjöström; published in the Proceedings of the VII International Congress on Architectural Envelopes (ICAE 2015), (ISBN: 978-84-88734-10-5). © H-House – All rights reserved. This project has received funding from the European Union’s Seventh Framework Programme for research, technological development and demonstration under grant agreement no. 608893.